Last week I published the following report. "The best analysts of Scotland’s finances have been celebrating the day too [..] there is one from Kevin Hague, commissioned by the Scottish Conservative party (of which Mr Hague is definitely not a member). This is the longest and the most comprehensive of the lot." If you haven't read it, please do (save the pdf, print it out, save as an ebook on your phone). It should serve as a valuable reference for anybody who cares about understanding the facts around Scotland's economic position within the UK. "to be fair, it is hard to poke holes in the extensive numbers he has gathered in this paper, based as they are on GERS and other government documents. He has set rigorous terms for any fiscal debate on Scottish independence [..] That Mr Hague’s numbers show we Scots are running a structural deficit worse than the UK’s is not some unionist plot to undermine the SNP. It is reality. And waving saltires at rallies will not make it go away." Whilst he couldn't resist a few poorly aimed digs at me in his blog, I applaud David's willingness to address the reality head on. Of course not everyone responded positively and so with a weary sigh I'm going to offer a brief response here. I'll ignore the predictable and feeble ad hom attacks from the likes of Wings Over Scotland's Stuart Campbell. In fact I've taken to ignoring him altogether (you should too by the way - it's like taking off a pair of tight shoes, you'll wonder why you didn't do it sooner). There were two responses in particular that were seized on by nationalists desperate to find an excuse to avoid facing the facts. On the left we have proud SNP member Alistair "wrote a Common Weal paper" Davidson and on the right we have those SNP cheerleaders Business for Scotland (who will need no introduction for regular readers of this blog). "One reason I know #Indy will happen is explosion of street-smart minds on our side. @moh_kohn dismantles @kevverage:"
I asked Pat if he'd read the report he thinks is being dismantled but he didn't reply. In fact - demonstrating a rather wonderful misunderstanding of how Twitter works - Pat tweeted that he's muted me because of some of the replies he received from some of the people who follow me. Hey ho. Anyway, let's see how he thinks Alistair managed to "dismantle" my report. I strongly recommend you read Alistair's effort ("Trial at the Hague") for yourself. He starts with a pseudo-intellectual ramble about the discipline of economics. He lists some economic schools of thought, just in case you doubt his ability to write down some names he's heard of. He claims mine can't possibly be an objective report because economics is not an objective discipline. If only he'd managed to read the very first paragraph of my report where I explain very clearly: "These figures are used to explain Scotland’s past economic performance (as an integral part of the UK) so as to inform our understanding of the future choices a possible independent Scotland would face". I'm not attempting to propose an economic solution, this is not a prescriptive report, it's merely an analysis and presentation of the past data. That's why it can be objective; it's fact based. He also dismisses the concept of an "understanding of practical economics", but we'll come back to that. The author is entirely using gross figures, rather than net. This is akin to subtracting your mortgage from your net worth, but refusing to count the value of your house. This is a quite staggeringly daft statement. Neither my report nor the GERS report are attempting to establish Scotland's "net worth", this isn't an asset valuation exercise. What this statement painfully exposes is the fact that Alistair in fact doesn't know the difference between a Cash-flow and a Balance Sheet. Understanding really basic concepts like this is the sort of thing I was referring to when I claimed an "understanding of practical economics", but I guess we already knew Alistair doesn't believe in such a thing. 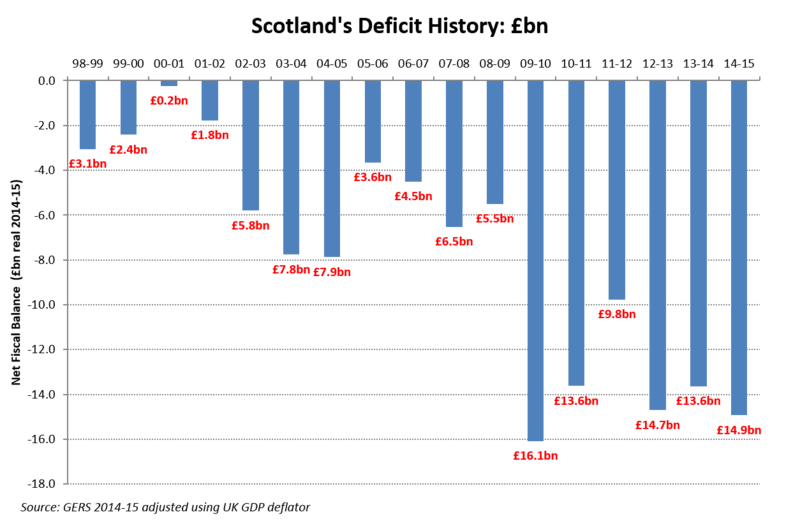 £3bn was spent on capital investment, leaving a Current Budget Balance deficit of £11.9bn or 7.8% of GDP. Still a challenging figure, but the author’s misuse of the statistics undermines his entire analysis. Aha! So he's talking about the difference between the Net Fiscal Balance and the Current Budget Balance (showing he doesn't actually understand the significance of the two figures in the process). Quite why my use of the Net Fiscal Balance figure, correctly naming it as such and using like-for-like definitions when looking at international comparisons is a "misuse of statistics" that "undermines (my) entire analysis" is not something Alistair explains. Maybe he thinks an independent Scotland wouldn't need to make capital investment? Does he offer other countries' Current Budget Balance figures for comparison? No, of course he doesn't. Many EU members breach the stability and growth pact. I notice that Alistair doesn't take the EU to task for their "misuse of statistics" by judging countries on their Net Fiscal Balance rather than their Current Budget Balance. He should maybe have a word with them? The pact was designed according to the same neo­classical economic theories that created the banking crisis and have plunged Eurozone economies into a lost decade of low growth. This 'objective' report has also taken the Better Together argument about EU membership as read. Actually no it hasn't. I was very careful to refer simply to Scotland's requirement to "negotiate EU membership". If he's seriously suggesting that Scotland wouldn't need to negotiate with the EU following a vote for independence ... well frankly I despair. Mind you, given his little rant above maybe he doesn't want us to be in the EU anyway? It's quite hard to tell what he thinks to be honest. This section rests on negotiations going entirely against Scotland. The author imagines Scotland being forced to close its notional deficit faster than any other nation outside the Eurozone has had to, while taking a full population share of UK debt, and no or limited assets. No it doesn't. I make no assertion about assets, he's just made that up. I make no judgement about the outcome of negotiations (which for example could well include the EU simply refusing Scotland re-entry until it had sorted out both it's own currency and its deficit). In fact let me just repeat precisely what I did say: "it is inconceivable that an independent Scotland would be able to negotiate EU membership (or indeed a workable currency solution) without having a clear and credible plan in place to dramatically reduce the scale of its deficit.". I stand by that. To 'prove' how poor Scotland is, the author has taken the 'objective' decision to exclude a major Scottish industry. I am tempted to write a similar report that excludes volatile banking and financial services from the UK's public finances. If he managed to read my report he'd realise that actually all I've done is isolate the impact of North Sea revenues for what, surely, even to Alistair are bloody obvious reasons. As for the banking and financial services analogy: really? If somebody claims that industry is "just a bonus", if we discover we have finite and maturing reserves of "financial services assets", if "banking and financial services" becomes a globally traded commodity and the price collapses ... well then maybe he should do that analysis. But that would require him actually doing some analysis with real numbers, so we can be pretty confident he won't. He then implies the current oil revenue slump is just a blip (repeating the standard "it's just about the oil price" line that I carefully debunk in my report) and rambles on aimlessly for a bit - look, I have guests, it's Easter Sunday, I refuse to waste too much time on this. Fiscal transfers to Scotland show that Scotland is a basket­case; fiscal transfers from Scotland are good pooling and sharing. I mean seriously? I explicitly point out that fiscal transfers from the UK are "good" pooling and sharing and he accuses me of saying they show Scotland is a "basketcase" (his word, I say nothing of the sort anywhere in the report). No citation is given for this 90 years figure. Nor does the author seem to understand economics. Arguments that bonuses from independence or the union could be found in the government accounts were always facile. So he hasn't read the footnotes (57, 58) and/or he can't do simple maths and/or follow the most simple train of logic. He then starts thrashing around, dismisses the White Paper ("we expect such arguments from politicians") and makes the palpably ludicrous statement that seeking evidence of economic impact in government accounts is "facile". Alistair's document isn't evidence of an "explosion of street-smarts", its a damp-squib. It isn't a "dismantling" of my report, it's a cringe-inducingly confident display of Alistair's own ignorance. That SNP cheer-leaders seize on Alistair's effort as something to celebrate merely exposes the intellectual vacuum that now lies at the heart of the Nationalist movement. This analysis uses the 2014-15 Government Expenditure & Revenue Scotland (GERS) report as its primary source. These figures are used to explain Scotland’s past economic performance (as an integral part of the UK) so as to inform our understanding of the future choices a possible independent Scotland would face. During the Independence Referendum the Scottish Government proposed March 24th 2016 as “Independence Day”. This context is highly significant. Had there been a Yes vote, the GERS figures analysed within this report would have been the “actuals” used for negotiations around EU membership and currency sharing. The GERS figures show that Scotland’s total net fiscal deficit in 2014-15 was £14.9bn or 9.7% of GDP. 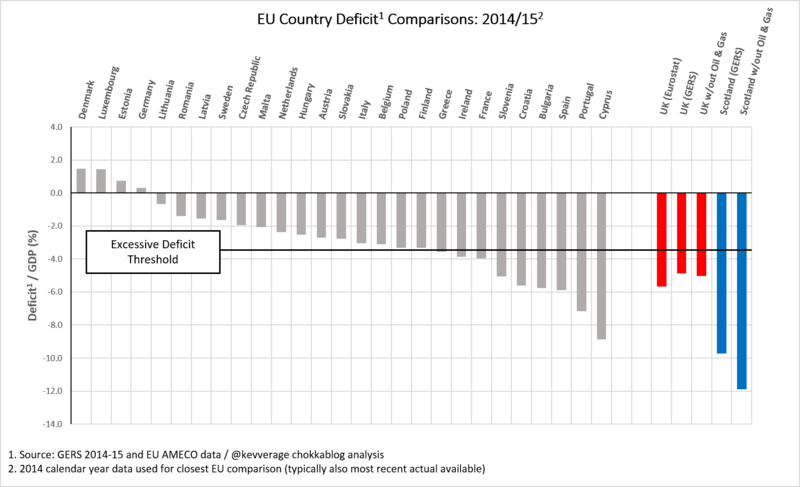 Scotland’s deficit/GDP was bigger than any EU country in 2014. Only Greece and Ireland (at the peak of the financial crash) and more recently Slovenia have shown worse deficits over the last 14 years. 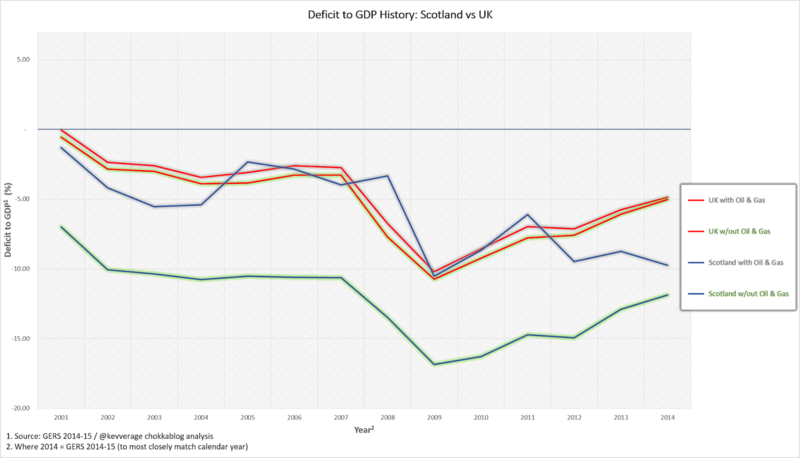 In 2014-15 the UK as a whole ran a deficit of 4.9%; on a comparable basis Scotland’s deficit was twice as bad. In the Independence White Paper (“Scotland’s Future: your guide to an independent Scotland”) the Scottish Government asserted: “On independence in 2016, Scotland’s estimated financial position will continue to be healthier than the UK as a whole. We will set out on a firm financial footing” (p.78). Those who suggested at the time that this was at best an extremely optimistic assertion were accused of “talking Scotland down”. The actual figures now show that those people were guilty of nothing more than understanding the tenuous nature of the case presented. The EU’s Stability and Growth Pact Excessive Deficit Procedure (EDP) defines an excessive deficit as 3% of GDP. It’s inconceivable that a prospective independent Scotland could be negotiating EU membership terms today without having a clear and aggressive deficit reduction programme in place. 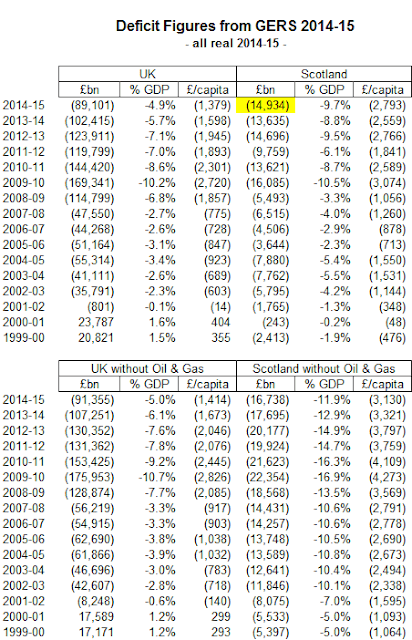 Scotland has had an onshore deficit gap to the UK of £8bn – £10bn over the last decade. 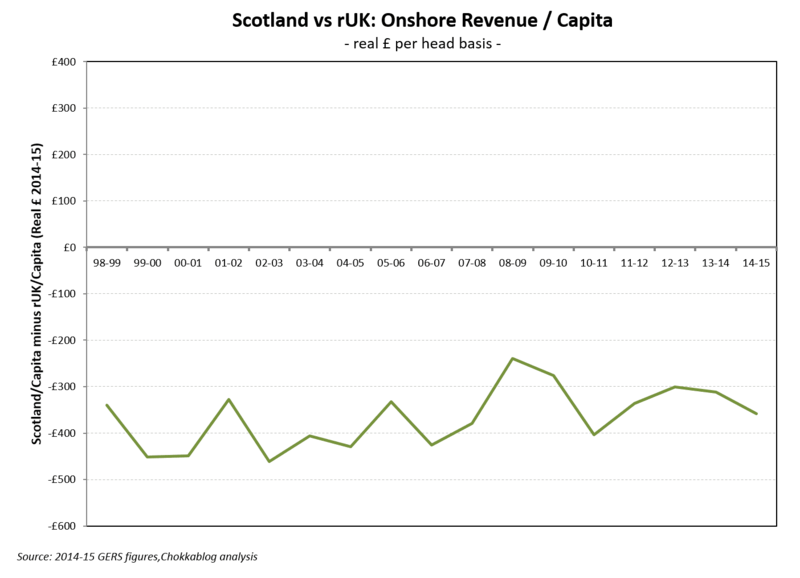 This onshore deficit gap has been disguised in the past by North Sea revenues. In three of the last 16 years these revenues have been sufficient to more than eliminate that gap and make Scotland a net contributor to the UK. 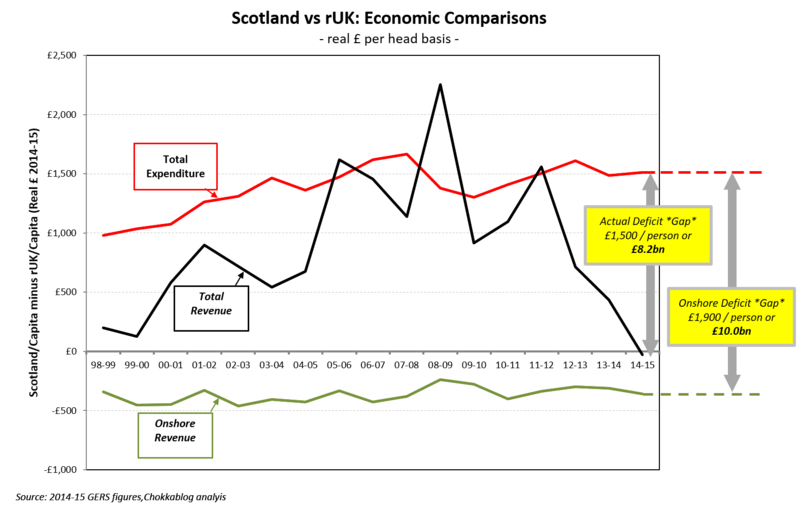 Declining North Sea revenues fully explain why Scotland’s deficit has diverged from the UK’s. This onshore deficit gap is not just a snapshot view, it’s a long-term structural reality. 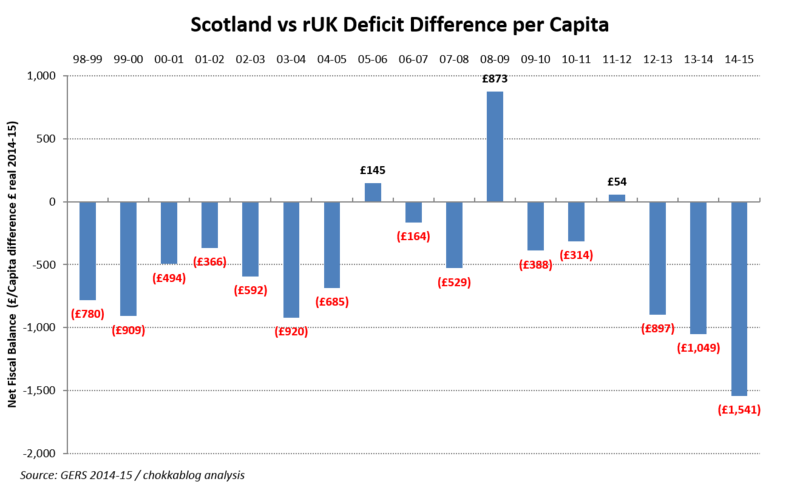 The outlook for North Sea revenues is bleak, with the OBR now forecasting negative revenues for the foreseeable future. Even a significant recovery in the oil price is unlikely to lead to them returning to anything like their historic levels. An independent Scotland would need to be fiscally sustainable without income from the North Sea, would need to be fiscally sustainable based on its onshore economy alone. In this context the crude economic case presented in the Scottish Government’s Independence White Paper is, frankly, discredited. The North Sea oil revenue forecasts used were clearly optimistic at the time, and subsequent claims that “oil is a bonus” simply cannot be reconciled with the harsh economic reality described in the Scottish Government’s own GERS report. Arguments that the onshore deficit gap between Scotland and the rest of the UK represents evidence of Westminster mismanagement are difficult to substantiate. 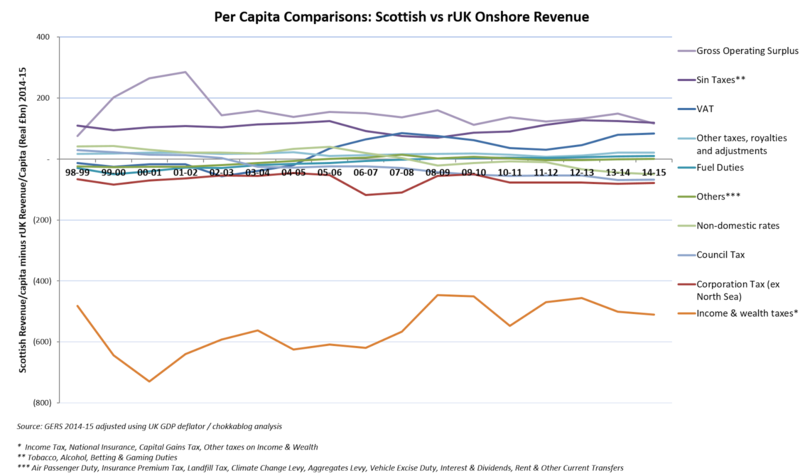 As a region of the UK, in absolute terms Scotland’s onshore revenue generation per capita is relatively healthy and Scottish onshore revenues have been growing in line with the UK as a whole. 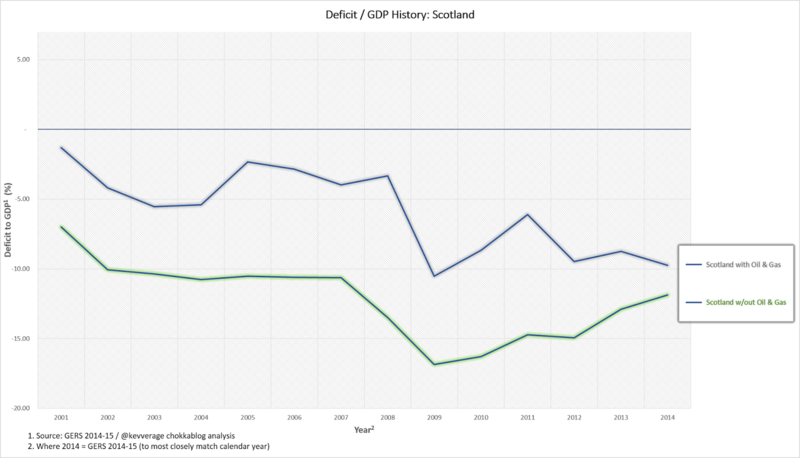 The deficit gap is primarily a result of higher expenditure per capita in Scotland due to structural issues that would not go away were Scotland to become independent. It seems perverse to blame “Westminster mismanagement” for allowing Scotland to continue to receive £1,500 higher spend per capita than the rest of the UK. Had Scotland voted Yes, EU and currency negotiations would place Scotland under pressure to rapidly find in the region of £9bn pa through increased taxes or reduced spend. That’s equivalent to £1,700 annually for every man woman and child in Scotland. For context: £9bn pa represents 13% of total Scottish public spending and is greater than Scotland’s entire education & training budget; it’s 17% of total Scottish onshore revenue and 77% of the total amount Scotland raises in income tax. The White Paper proposed just £0.6bn of net savings, primarily through defence cuts. These saving were not to be used to reduce the deficit but to pay for childcare reforms, end the bedroom tax and introducing “competitive business taxation”. Not only is it clear that in fact a newly independent Scotland couldn’t afford these reforms, there would need to be net savings 18 times as large as anything identified in the White Paper. There can be no reasonable doubt that had Scotland voted Yes we would be required to pile austerity on top of austerity, we would be subject to austerity squared. Because Scotland voted No it is possible to take a more considered long-term view of how to close this deficit gap; we have time to try and address the deficit gap through economic growth while benefitting from support from the rest of the UK. That the rest of the UK provides fiscal support to Scotland can be seen as simply the quid pro quo for Scotland’s North Sea tax revenue contributions since 1980. If we had “started the clock” in 1980 then Scotland would still be in credit as a result of the large contribution made during the oil boom years (and seems likely to remain so for the next 7 years). Of course starting this calculation in 1980 paints the most favourable picture for Scotland, but it clearly illustrate the benefits of pooling and sharing over time. To close the deficit gap with the UK – to be in a situation where becoming independent wouldn’t make Scots immediately worse off – would require Scotland to out-grow the rest of the UK by 17%. That’s quite a challenge. If Scotland were to achieve the rates of superior growth that the White Paper suggested as illustrative of the “bonus of being independent” it would take over 90 years. None of this is to suggest that Scotland couldn’t be an independent country or that raw economics should be the only consideration. But if we’re to be honest about the economic implications, it now seems clear that independence will only happen within our lifetimes if the majority of Scots are willing to vote to become considerably worse off, quite possibly for generations to come. The linked pdf above provides full explanations around methodology and sources along with a carefully worded commentary - so please do read it if you are interested in the detail (and before posting ill-informed comments that will lead me to post a reply saying "why don't you just read the full report?"). For those who would rather just surf the data or want quick and easy access to the exhibits without the caveats and methodological explanations, I include them all below. 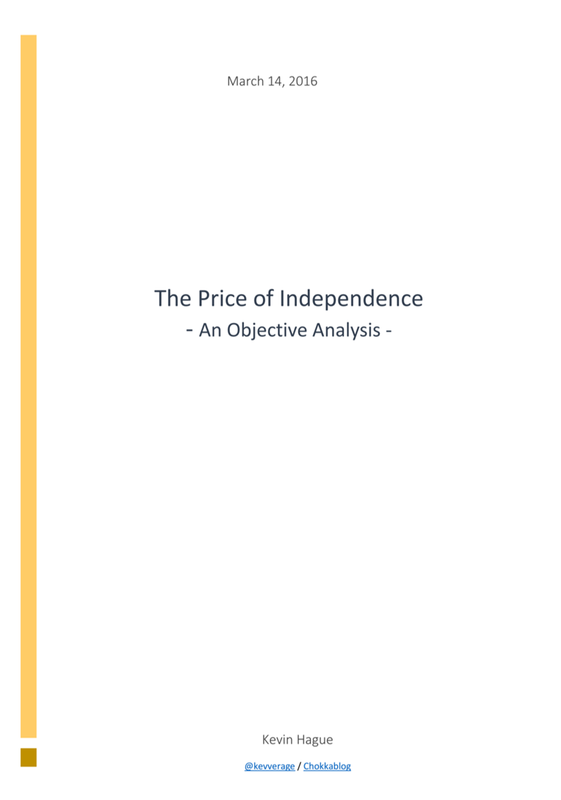 Please note that the pdf above includes considerably more information than the following HTML, it covers all the tediously predictable "but GERS tells us nothing about an independent Scotland" arguments you'll here from the mouth-breathers on Twitter ...you really should just read the pdf. 1. 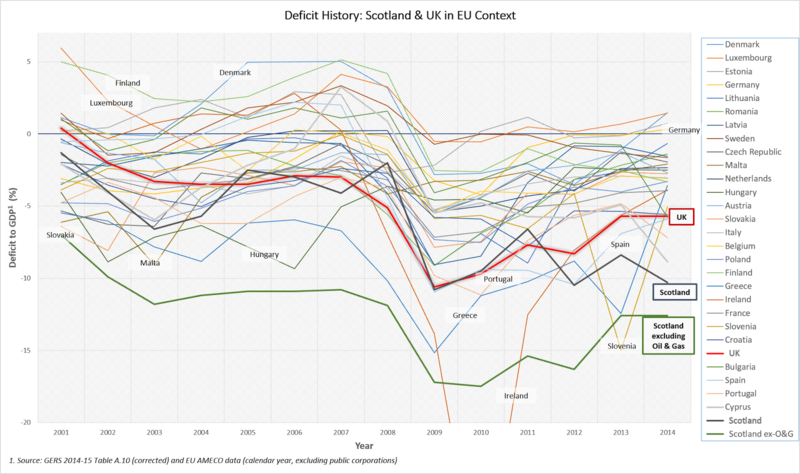 How does Scotland’s fiscal position compare with the UK’s and other EU countries’? This is a helpful graph for placing some of the independence referendum rhetoric in context. Although the numbers have been restated slightly since, the highlighted area below shows the figures used to support the many “in the last 5 years”  claims made by Alex Salmond during independence referendum debates and the (at the time correct) assertion by John Swinney that “Scotland more than pays her way in the UK”. This is worth remembering when some of the more intellectually challenged cybernats suggest that GERS tells us nothing of value. We should be very clear about what this analysis of historical fiscal data can and cannot tell us. The figures only tell us how an independent Scotland’s finances would have looked if we had already been independent but were still raising taxes and incurring public spending (including reserved expenditure) as we have been as an integral part of the UK. We are looking at what in financial accounting terms would be considered pro-forma accounts. 2. What causes the fiscal gap between Scotland and the rest of the UK? In this section comparisons are all on a per capita basis, in real terms (inflation adjusted using the UK GDP deflator) and compare Scotland with the rest of the UK (i.e. the UK minus Scotland). The chart below simply adds up all the lines from the graph above to show that, in aggregate, Scotland’s onshore economic activity (i.e. before factoring in the impact of North Sea oil) consistently generates £300 - £400 per capita less than the rest of the UK. 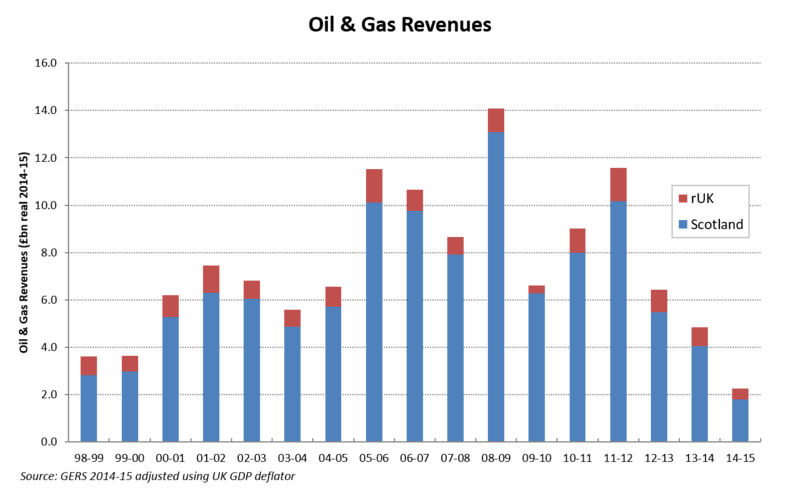 The following chart shows the implications of this in terms of per capita revenue difference (the grey line). 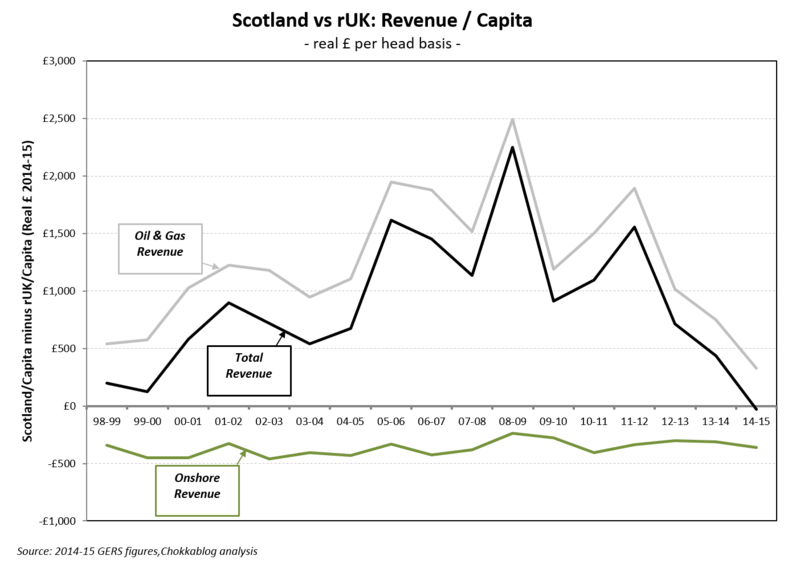 Adding this to the onshore revenue per capita difference (the green line) show Scotland’s total public sector revenue per capita difference to the rest of the UK (the black line). 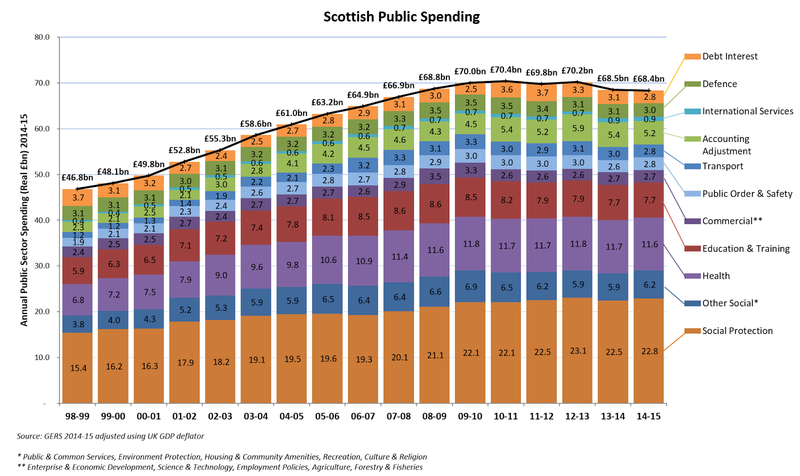 The following chart shows absolute total Scottish public sector spending in real terms over the last 17 years, broken down into main categories. 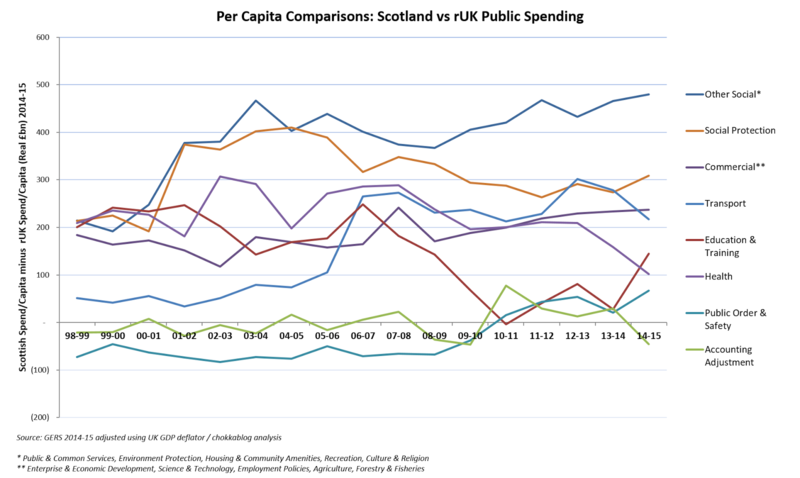 The following chart illustrates how this varies by major spending category on a per capita basis vs rUK. Note that because Defence, Debt Interest and Foreign Affairs are allocated on a per capita basis they’re excluded from this chart (as they would simply show zero in every year). 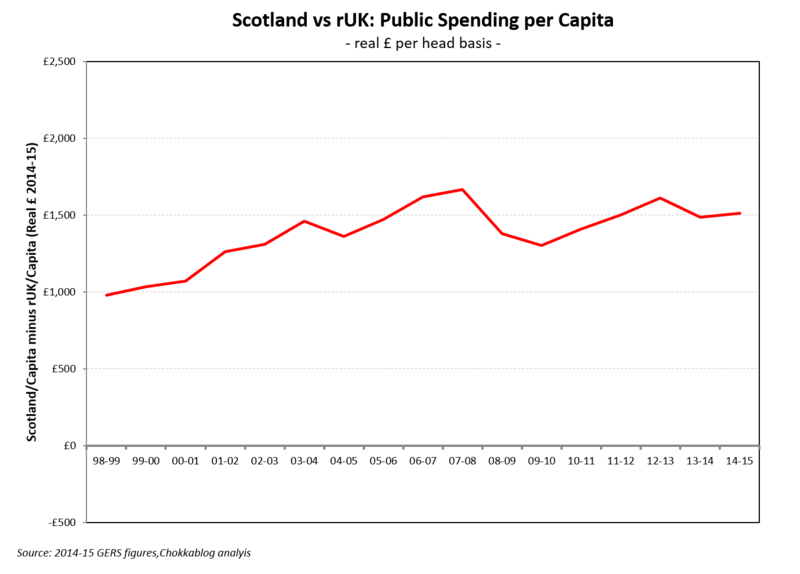 As with the revenue categories, the chart below simply adds up all the lines from the graph above to show that, in aggregate, Scotland receives public spending (including shared UK costs) of around £1,500 per capita more than the rest of the UK. This gap has increased in real terms by £500 per person since 1998-99. To understand how these figures create a fiscal gap we simply need to combine the per capita figures we’ve already shown for revenue and spending. 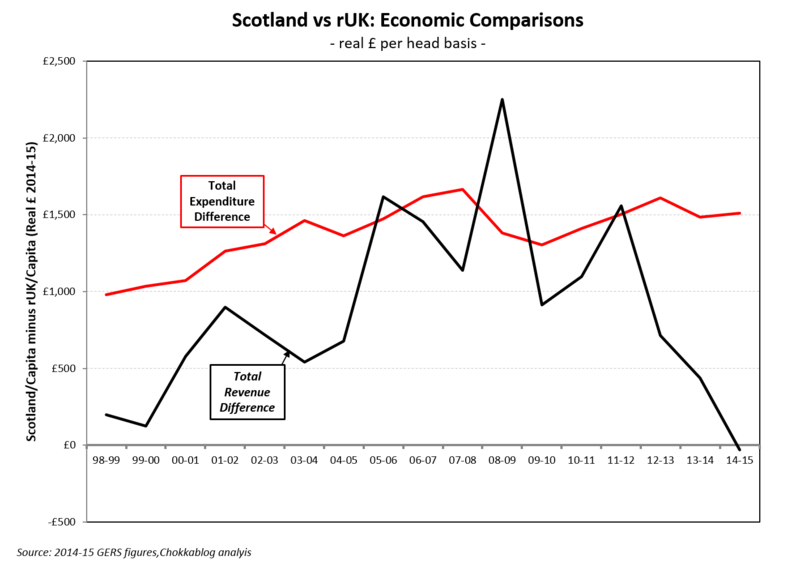 When Scotland’s relatively higher revenue raised exceeds the relatively higher expenditure received (when the black line is above the red line) then Scotland has a lower deficit per capita than the rest of the UK. 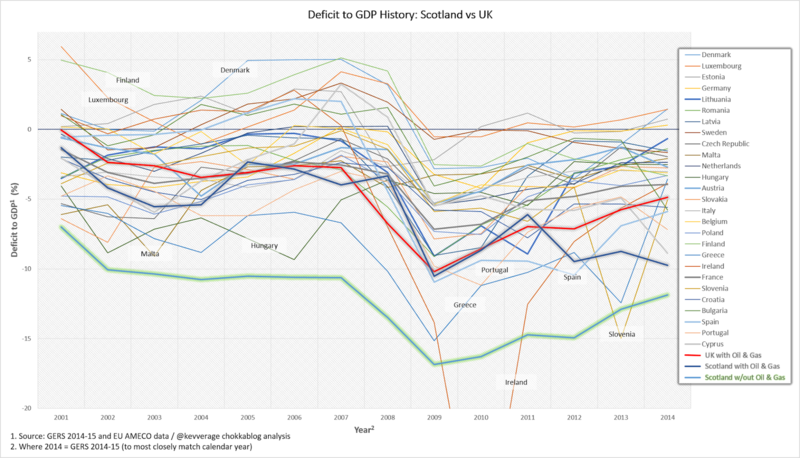 Simply plotting that gap between the red and blue lines shows us the difference between Scotland’s per capita deficit performance and the rest of the UK. 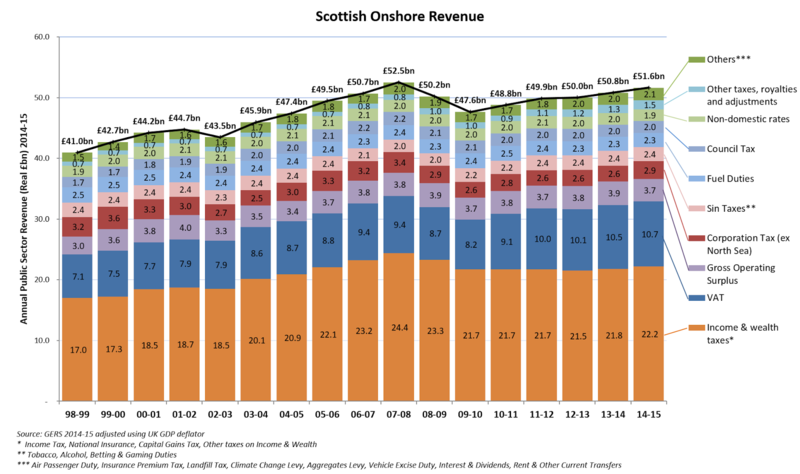 Given we know the split of the revenue difference between onshore and offshore revenue sources, we can now summarise on one chart the scale and historical trend in both the total deficit gap and the onshore deficit gap. 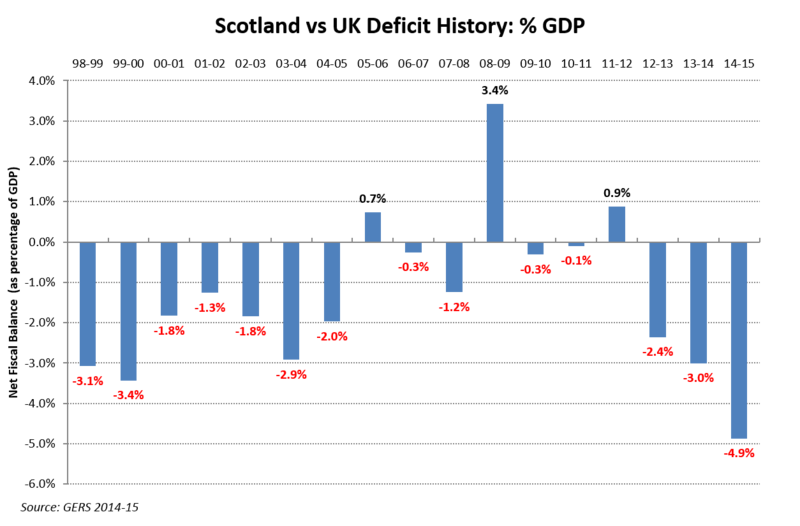 The onshore deficit gap (the gap between the red and the green lines) is the most important figure to understand here. 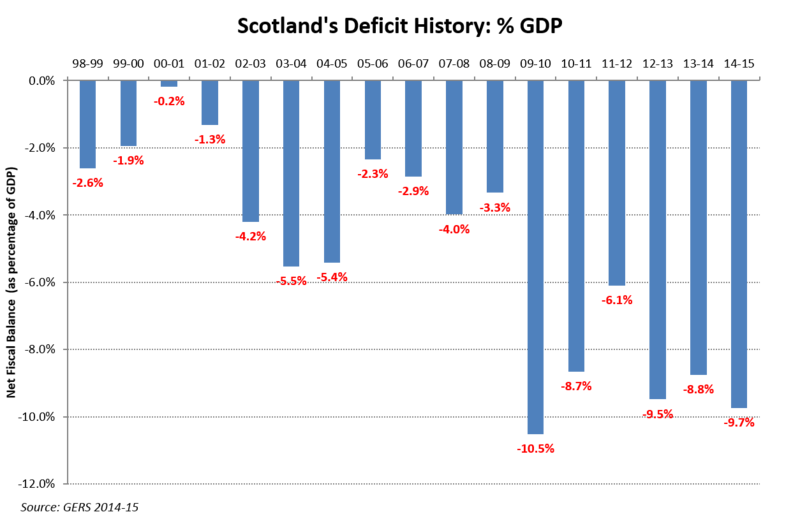 Whilst the actual deficit gap has been volatile as a result of fluctuations in oil & gas revenues, the onshore deficit gap has been fairly consistent. In the most recent year this gap is £10bn (or £1,900 for every man woman and child in Scotland). 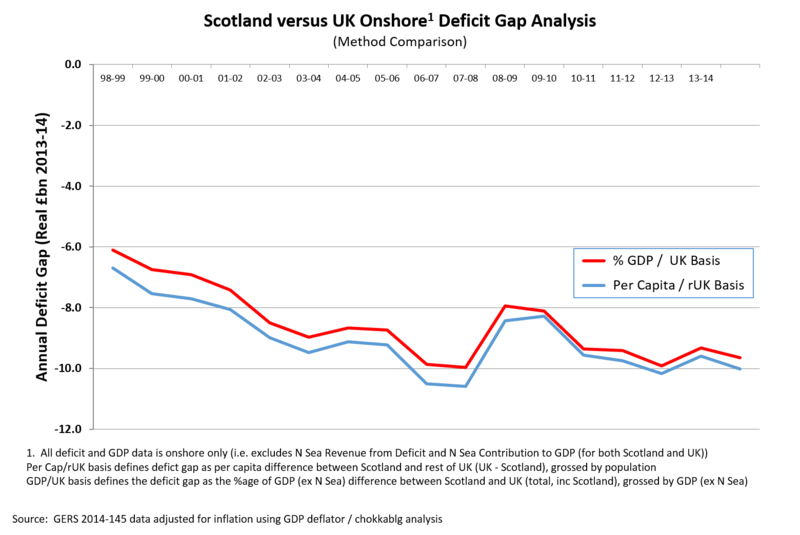 The following chart plots this onshore deficit gap over time and compares it to the figures we would get if we had instead used GDP (excluding oil & gas) and total UK as our comparison basis. The analytical method chosen makes no material difference. 3. What does this mean for the case for Independence? The importance of oil & gas to the Scottish economy is perhaps most starkly illustrated if we place a notional independent Scotland without oil & gas revenues in an historical EU context. This is surely compelling evidence of the absurdity of Alex Salmond’s assertion that, within the context of Scotland’s economic performance, oil is merely “a bonus”. The Scottish Government have produced illustrative figures that go back to 1980 which, although not as robust as the GERS figures, allows us to place oil & gas revenues in a more complete historical context. 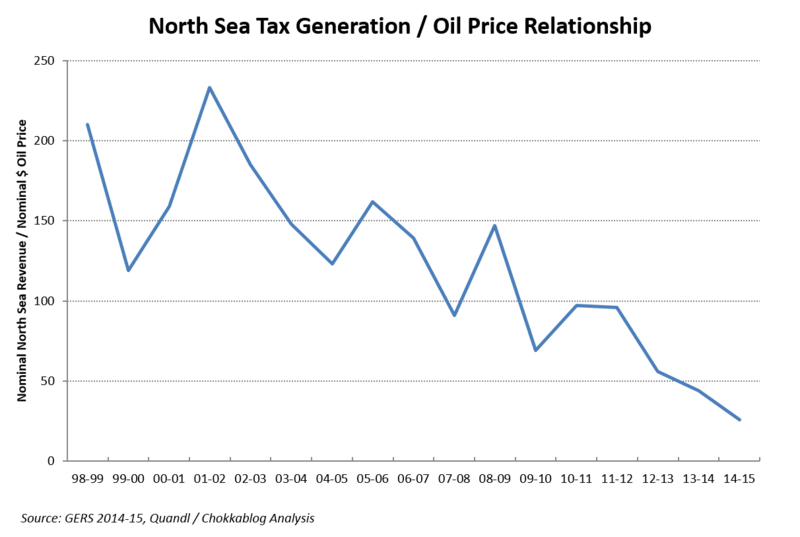 This graph shows us the massive contribution that “Scotland’s Oil” made to the UK economy in the 1980’s. 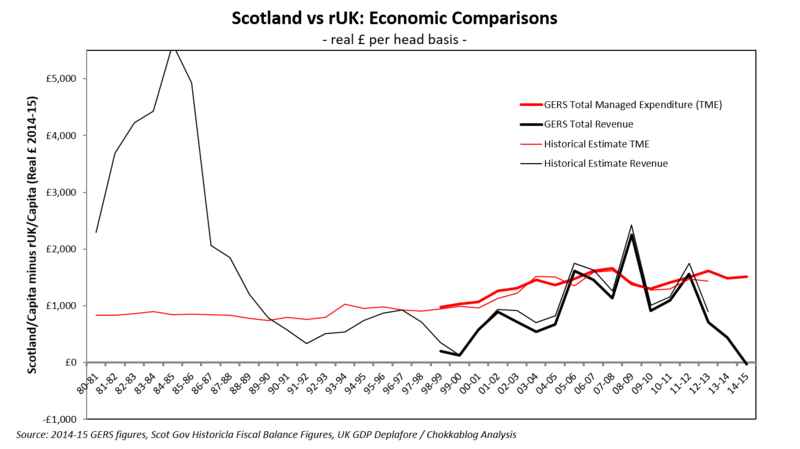 Given that when the black “higher per capita revenue” line is above the red “higher per capita spend” line, Scotland can be judged a net contributor to the UK (and vice-versa) we can work out Scotland’s real terms net contribution since the oil boom began. These numbers are relatively crude, but Scotland’s cumulative net contribution from 1980-81 to 2014-15 on this basis works out at £12,600 per capita (or £67bn). With Scotland’s run-rate onshore deficit gap being £1,900 per capita, assuming no oil recovery it will take about 7 years before Scotland becomes a net recipient of funds since 1980. Of course 1980 is the starting date that most favours Scotland; were we to start at an earlier date we’d see a different picture. This is a rather narrow transactional view of Scotland’s relationship with the rest of the UK and based on an arbitrary date that favours Scotland - but this analysis does show that within the context of the last 35 years Scotland can be said to still be “in credit” with the rest of the UK. Some would argue this is all the more reason for Scotland to remain within the UK: Scotland made a massive net contribution to the UK during the 1980’s and the current ongoing fiscal support the rest of the UK offers is simply the quid pro quo for that. It could be said that we’re experiencing pooling and sharing in action. The key point here is that oil & gas tax revenues are a function of a lot more than just the oil price because they are a tax on total production profit . 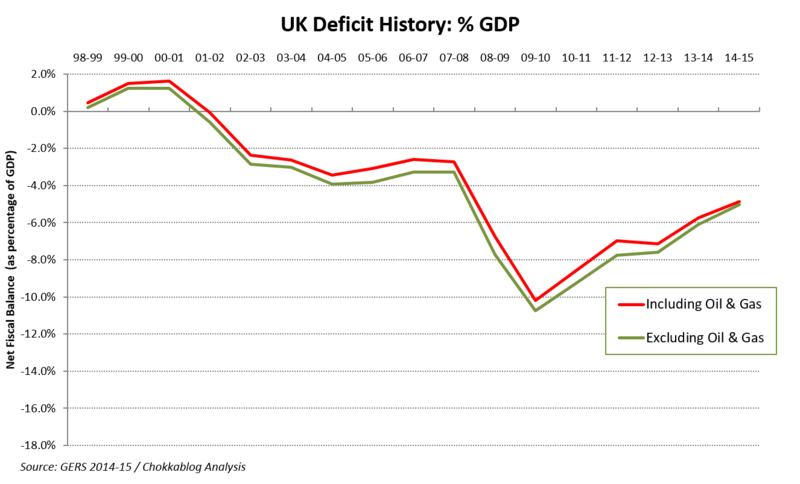 We can illustrate this very simply by plotting the ratio between actual oil & gas revenues and the dollar oil price. If there was a direct correlation between $ oil price and North Sea Tax generated then this would be a horizontal line. This illustrates why a return to $100 a barrel oil prices would not translate into a return to historical North Sea revenue levels). 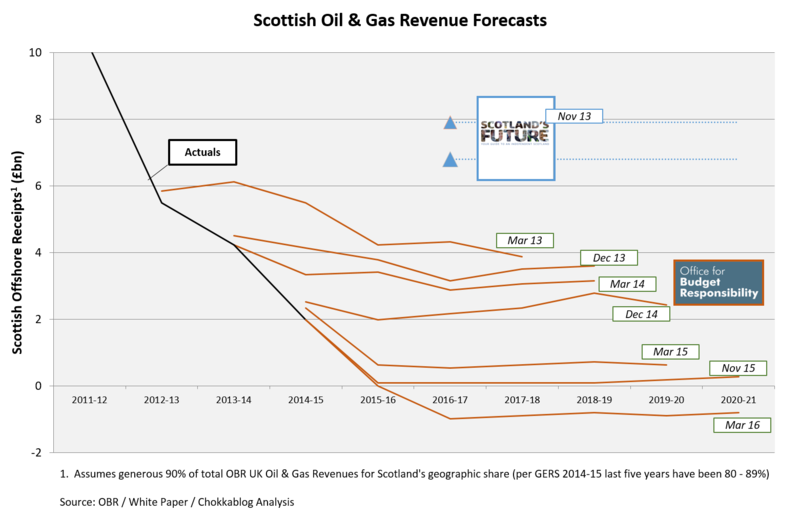 The optimism of the White Paper oil and gas revenue scenarios is clear to see when we look at how they compared with contemporaneous OBR forecasts, actuals and more recent OBR forecasts. At the time of writing the White Paper, the Scottish Government chose scenarios (£6.8bn and 7.9bn) which were about twice as optimistic as the OBR were forecasting at that time. The OBR had always been shown to be optimistic prior to this date, a record which it continues to maintain. 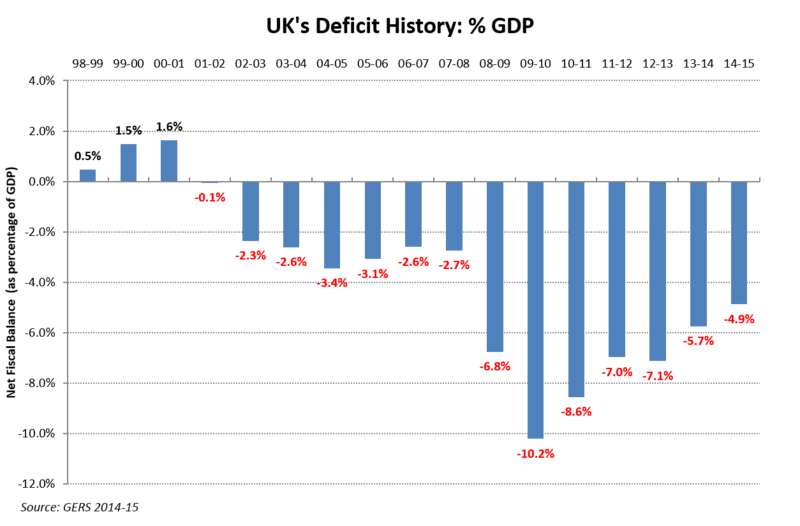 The effect of decommissioning costs and tax credits from the carry back of trading losses means that the OBR is now forecasting a negative contribution from the North Sea for the foreseeable future . It’s clear that oil & gas revenues would not come to an independent Scotland’s rescue any time soon, if ever. In this context and assuming we’d voted Yes, Scotland would have to find roughly £9bn a year through some combination of higher onshore revenues or lower public spending (than that allocated to Scotland in GERS). This would be required simply to close the gap with the UK (to avoid independence making Scots poorer) or, within an EU context, to be seen to be addressing the excessive deficit. For both EU membership negotiations and UK currency sharing arrangements a plan to rapidly reduce the deficit (to close the deficit gap with the UK) would clearly be required. It is simply not credible that in this context an independent Scotland would be able to simply borrow more to fund what would be considered by most observers to be an excessive deficit. We’ve seen that GERS shows Scotland receiving £68.4bn of public spending in 2014-15, so in overall terms a £9bn saving would represent a 13% real terms spending reduction. To put that figure in context, in the five years from 2009-10 to 2014-15, Scotland has seen real terms spending reduced by just 2.3%. The White Paper suggested that “savings or increases in revenues” could have generated £0.6bn a year, primarily from a £0.5bn reduction in defence spending (i.e. effectively including “scrapping Trident”). This figure also includes £0.05bn savings related to “contributions to the costs of the House of Commons and the House of Lords”. This money was then to be used to pay for childcare reforms, end the bedroom tax and introducing “competitive business taxation". If there were other easy wins we can be confident that the SNP would have included them in their outline economic case. That there aren’t is testament to the quality of the GERS cost allocations and gives a lie to the often repeated (but simply wrong) claims that Scotland is unfairly burdened with costs in the GERS figures. 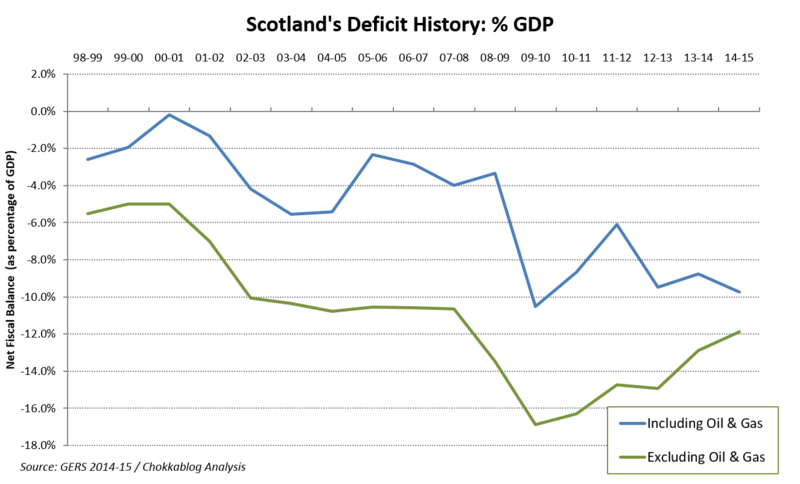 Debt interest is sometimes cited as a possible saving on the basis that Scotland might negotiate to not take on its per capita share of debt. Given that this would be seen by capital markets as an effective debt default and that the “Plan A” for currency was to share Sterling with the UK, this seems a somewhat unlikely scenario. Scotland’s total per capita allocated debt cost in 2014-15 was just £2.8bn, so even if this figure could be wished away, it doesn’t come close to solving the £9bn deficit gap we’ve identified. Considering the fact that the notoriously optimistic White Paper could only come up with £0.6bn of savings helps us appreciate the scale of this challenge. Scotland’s draft budget for 2015-16 shows just a £0.5bn saving to Fiscal Departmental Expenditure Limits (DEL). £9bn is more than 3 times Scotland’s total annual Public Order & Safety spend, greater than total Education & Training costs, is 80% of Scotland’s total Health costs. It would be no exaggeration to say that were Scotland to be in a position of having to rapidly tackle its stand-alone deficit – had the Yes campaign prevailed – the level of austerity required would have put existing austerity measures in the shade. This would be austerity on austerity: austerity squared. Raising revenues through raising tax rates is of course fraught with difficulty, not least because the act of raising tax rates can adversely affect the level of economic activity available to be taxed. We’ve seen that GERS shows Scotland generated £51.6bn of onshore revenue in 2014-15, so in overall terms generating an additional £9bn would require a 17% real terms increase. £9bn is 77% of Scotland’s income tax generation, it’s 84% of total VAT raised in Scotland, it’s 4.5 times the total amount raised through council tax. It seems pretty clear that to have a material impact on Scotland’s deficit, a combination of higher taxes and dramatically reduced public spending would be unavoidable. In the five years from 2009-10 to 2014-15 Scotland has seen real terms onshore revenue increase by 8%. So even if spending was frozen in real terms, at this rate it would take a decade to deliver the £9bn required from onshore revenue growth alone. This is time that Scotland would be unlikely to be given by the EU or indeed the UK as a currency partner had we voted Yes. But reducing the deficit through revenue growth while freezing public spending for a decade doesn’t close the gap versus the UK. This would only get us to where the UK is today (a 4.9% deficit) in ten years’ time - by which time of course the UK itself would have grown. Growing in line with the UK doesn’t help close the deficit gap, it doesn’t address the issue of Independence making Scots poorer. To address that issue Scotland needs to deliver superior growth to the rest of the UK. Putting aside the arbitrary nature of the time period chosen and countries used for the illustration, the suggested figure was 3.8% cumulatively over a 30 year period. At that rate it would take over 90 years to close the fiscal gap with the UK through superior GDP growth alone . It is worth noting that while Independence would undoubtedly give Scotland the freedom to pursue different economic policies from the UK, there is little evidence (particularly given the decline in North Sea revenues) that the Scottish economy has significantly different needs from the rest of the UK. In this case the pro-independence argument collapses down to little more than a belief that Scottish politicians serving Scottish people would simply make better decisions. One doesn’t need to believe that the case for independence is just about the economics to wish for the economic implications to be understood. None of this analysis suggests that Scotland couldn’t be independent, it merely highlights the likely price that we would have to pay. What the GERS numbers show us is that the likely price we would have paid for independence had there been a Yes vote would have been of the order of £9bn a year; that’s about £1,700 a year for every man, woman and child in Scotland. On Tuesday the Scottish Government published the Government Expenditure and Revenue Scotland (GERS) figures that show how our economy performed in 2014-15. The numbers make sobering reading when you consider that, if Scotland had voted Yes, the SNP’s proposed “Independence Day” would be just two weeks away. The figures show Scotland ran a deficit of £14.9bn in 2014-15. This means that the taxes we raised in Scotland fell £14.9bn short of covering the public spending we received. Of course these numbers only show us where an independent Scotland would have started from, what our deficit would have been if we’d kept paying taxes and receiving public spending at the rates we’re used to. In fact they show us that this simply wouldn’t have been possible. 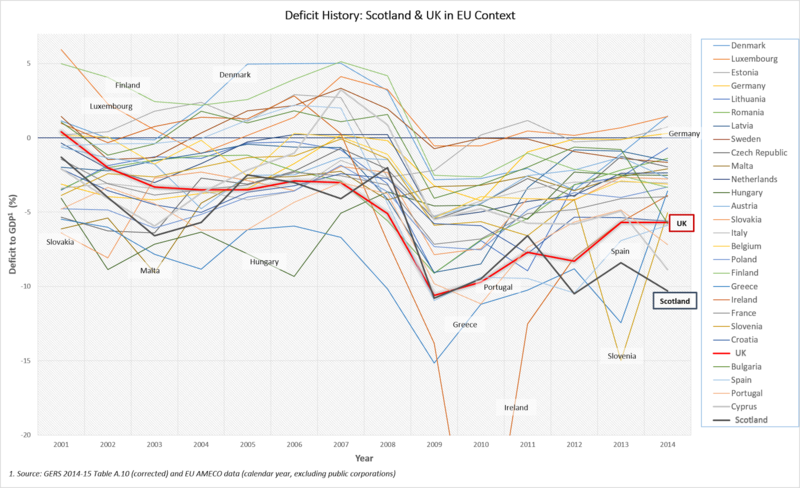 It’s true that most countries run deficits, but the scale of an independent Scotland’s deficit relative to its economy would be a problem. We measure this by looking at deficit as a percentage of Gross Domestic Product (GDP). On this measure, in 2014-15 the UK’s deficit was 4.9% but Scotland’s was 9.7%. This would be unsustainable. 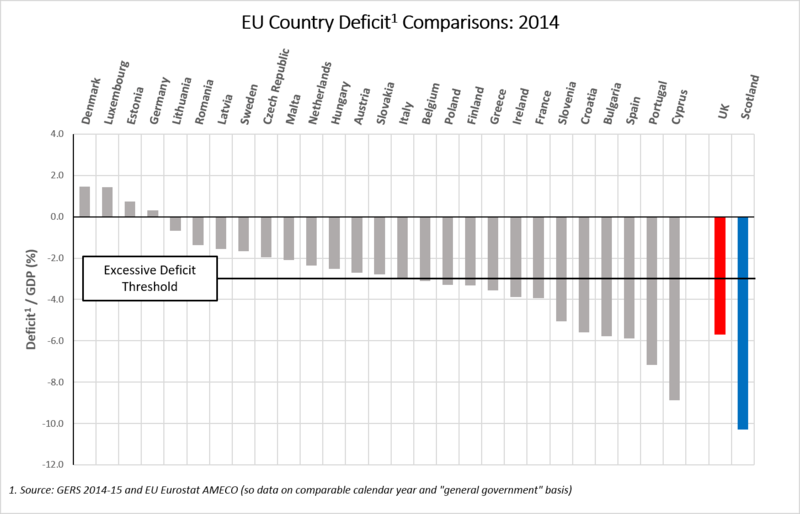 There isn’t a single country in the EU with a deficit as high as this. In fact the EU sets an “excessive deficit threshold” of 3.0% beyond which member countries have to be seen to be taking corrective action. Since 2001, only Greece and Ireland have reported deficits of greater than 9.7% in consecutive years and they had to adopt extreme austerity measures as a result. These figures are not an unrepresentative snap-shot. 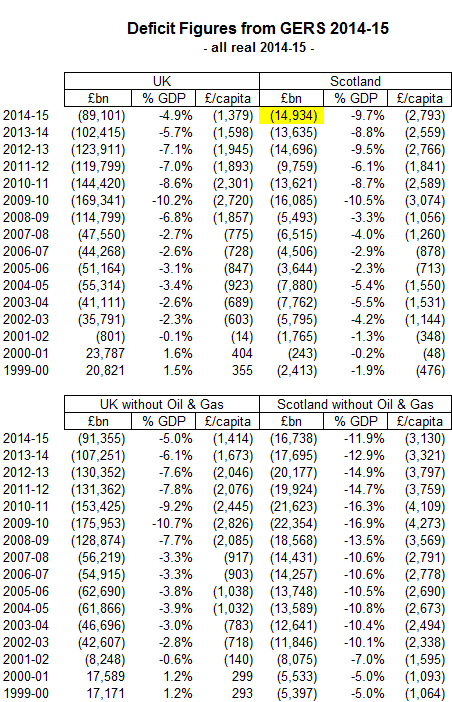 If we take oil revenues out of the picture, the GERS figures show that Scotland’s deficit would have exceeded 10% of GDP in every single one of the last 13 years. 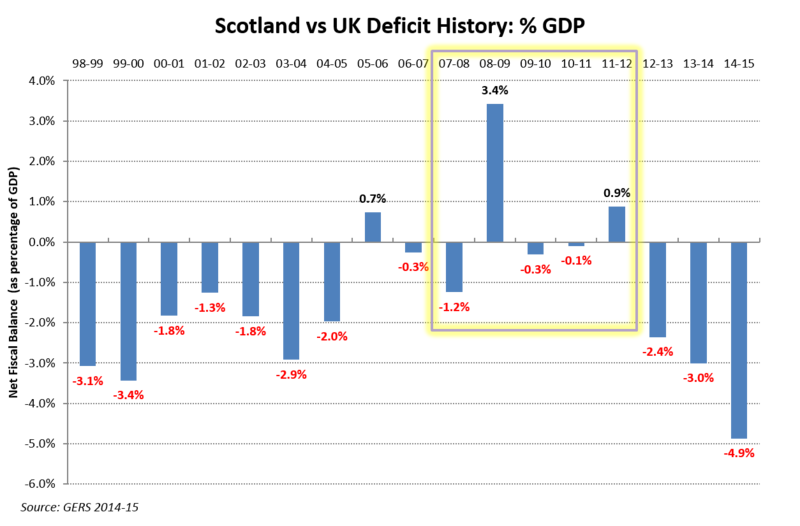 Oil revenues have obscured a consistent underlying onshore deficit, their decline simply reveals it. This is why the SNP’s independence referendum claim that “oil is just a bonus” was always ridiculous. It’s why the independence White Paper had to assume annual oil revenues of £7.9bn. The truth is now out. Our oil revenues in 2014-15 were just £1.8bn and we know that in 2015-16 they will be nearer £0.1bn. It’s clear that without past levels of oil revenue Scotland simply wouldn’t be able to support the public spending we’ve become used to. Some see the fact that Scotland’s 2014-15 deficit per head of £2,800 was twice as bad as the UK’s £1,400 as evidence that the UK has somehow failed Scotland’s economy. Dig a little deeper though and we see that Scotland generated the same tax revenue per head as the rest of the UK but enjoyed £1,400 more in public spending. So Scotland’s economy was as tax productive as the rest of the UK but we got to spend £1,400 more per person on public services. This higher per person spend in Scotland is a long-term trend and largely due to of our lower population density and older average population. It’s hard to see how that means the UK is failing Scotland. This does of course mean that the rest of the UK is currently supporting Scotland by about £1,400 per person, but we shouldn’t forget that during the oil boom of the 1980’s the money flowed the other way. We’re simply experiencing the upside of pooling & sharing resources over time. If we’d voted yes, an independent Scotland would be using these latest GERS figures as the basis for our negotiations with the EU about membership, the UK about possible currency sharing and international debt markets about borrowing. It’s inconceivable that any of these negotiations could succeed without a credible plan being in place to rapidly reduce Scotland’s deficit. It’s pretty clear we couldn’t have afforded to simply assume we’d grow our way out of it or hoped for another oil boom, we’d have needed to take action by dramatically reducing public spending and/or raising taxes. 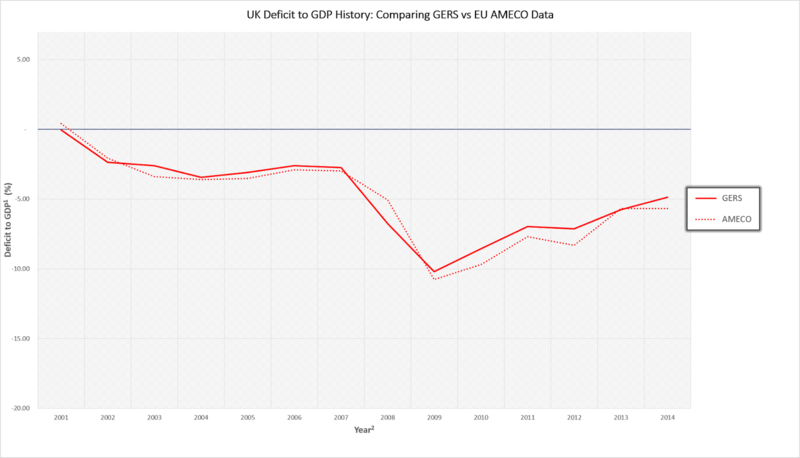 In the aftermath of the financial crisis which saw the UK deficit peak at 10.2% in 2009-10, the UK adopted an austerity strategy that’s reduced that deficit to 4.9%. Unfortunately Scotland’s deficit of 9.7% is after taking our share of those austerity measures, so we’d need more. A lot more. 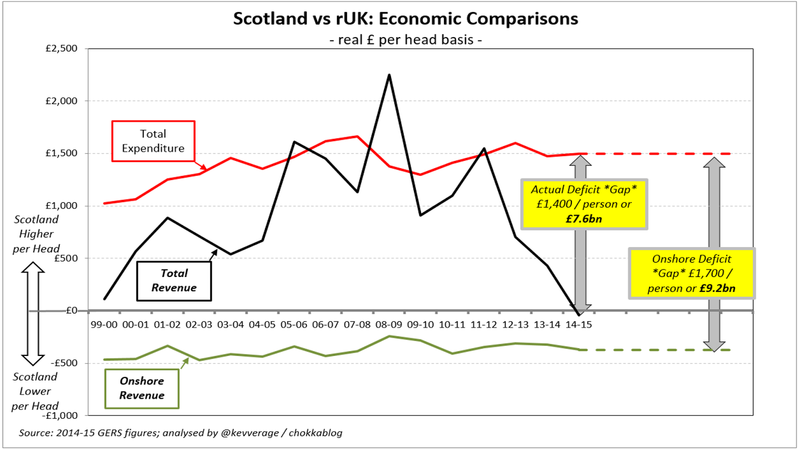 For an independent Scotland to share sterling we’d likely be required to run a similar level of deficit to the UK. This would mean finding about £8bn a year through some combination of higher taxes or lower spending. The White Paper assumed that we’d save £0.5bn a year mainly though Trident and other defence cuts. Scottish Labour’s proposal to raise income tax by 1p would have raised £0.5bn a year. This year’s draft Scottish Budget includes £0.5bn of cuts. In this context we can see that saving £8bn a year would lead to economic hardship far beyond anything currently being contemplated while we remain in the UK. We should probably be glad we voted No.